Several years back, my colleague, Karen, and I considered putting up a sign at the entrance to the library that would have read: “Must have brain in order to use our facilities”. We decided against it not because Higher Up might object, but because we figured the patrons wouldn’t actually read the sign. I’ve been in the process of hiring a new assistant so, being short-handed around the office, I naturally have a backlog of work built up. Some of that backlog is heaped on my desk in piles about the size of the Tower of Babel. Yesterday, a young gentleman came in about 45 minutes before closing. He wanted to purchase some copies of our oral history interviews. I explained that it would take a couple of weeks to fill his order as I had other requests ahead of him. He kept changing his mind, asking for different tapes, and then being disappointed when I quoted him the same timeline. In spite of the evidence in front of his eyes, he clearly believed that if he asked for something different, I could magically make the copies for him that very minute. 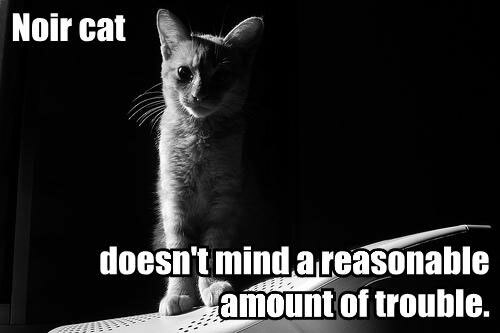 Another patron, a middle-aged woman, came in to the reference desk several weeks ago. She wanted to find a book about Eskimos that she had seen in a bookstore. She couldn’t remember the title, the author, when it was published, had only the sketchiest notion of what the cover art might be—in short, she couldn’t supply us with any information that might have enabled us to find this book. As a last ditch effort, I volunteered to take her down to browse the Native American section of the Alaskana collection in the off-chance she might run across this book. We have, I may add, an entire floor devoted to the Alaskana collection and have several hundred books on Eskimos, broken down by ethnic group (Inupiat, Yupik, Siberian Yupik, Canadian Inuit, Greenland Inuit, etc.). Patron: (still not grasping why we can’t find the book she’s looking for as I lead her downstairs) You must have books about Eskimos. Me: We have a lot of them, yes. Patron: So you don’t know the book I’m looking for? Me: (with an emphasis clearly lost on her) We have A LOT of them, yes. Some days I think patrons should wear little name tags on their shirts that say: “I don’t get it”. It would be a help to us all. 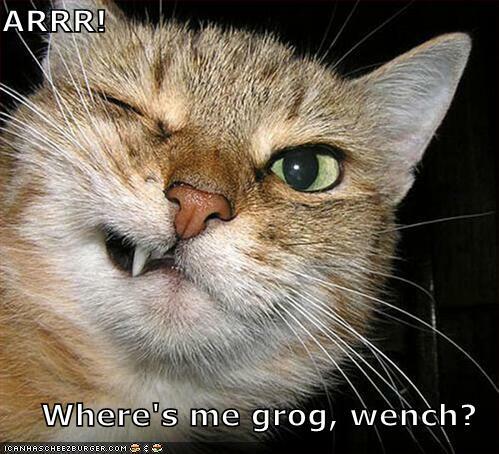 Cap’n Scratchy reminds the rest of you lubbers that tomorra be Talk Like a Pirate Day! What’s that, mess mate? Ye’ve never heard of Talk Like a Pirate Day? Then click here at once. Rated “Arrrr” for naturally pirate-y goodness. Jennifer Macauley has included my post on “What Library 2.0 Means to Me” on her Library 2.0 Roundup-Redux page, a handy source for thoughts on Library 2.0. There are opinions from well-known librarians as well as from your average Jane librarians like myself. If you are looking for more librarian blogs to check out, have a gander at Top 25 Librarian Bloggers by the numbers. Some of the blogs I recognized, some I didn’t. Good jumping off point. Daniel Cornwall, one of my Arnorian colleagues, has put together this list of amusingly titled government documents. My personal fave: “Who are the Zombie Masters and What Do They Want?”. Brains would be my guess ….. If you have to give public presentations of any nature, this article, “How to Make Yourself Unforgettable”, contains some of the best advice I’ve ever read on the subject. I particularly recommend taking a look at the four pointers at the end of the article. Number two, “remember it’s not about you” really goes a long way to conquering stage fright. Because I’ve been in the midst of hiring a new assistant recently two job-related blogs, YourHRGuy and Resume Hell: Dumb Stuff I Read on Resumes, stood out for me. Both are business-oriented, but if you deal with recruiting as part of your job, you’ll like reading them. Found these pictures posted by Iris Jastram, who’s a reference librarian at the absolutely lovely Gould Library at Carleton College in Northfield, Minnesota. Have a look at the library sign photos as they are particularly entertaining. The person who does signage around their library is clearly a card. I am deeply envious of Carleton’s beautiful library. If you added barbed wire and armed guards to the top of the University of Arnor’s Library, it would more closely resemble the maximum security prison it was clearly based on. For a long time, the library had grey staff T-shirts that went well with the incarceration theme. All that was missing was our employee ID number across the back. In this picture, I am the orange cat. 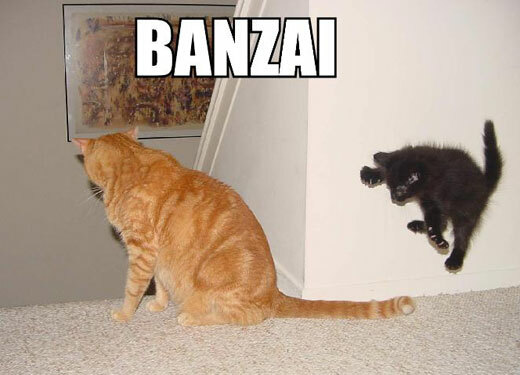 The black kitten represents my day so far. Admittedly, we only had a four day work week, but those four days have seemed very long indeed. Sudafed, take me away! We have been invaded by phorid (rhymes with horrid) flies. Think of a bunch of flies slightly smaller than your thumbnail with a passion for light-colored walls (of which the library has many) and a serious attitude problem. Now that the cooler weather has come said flies have decided to take up residence inside the library and other university buildings. So not only do you have an unattractive fly build up on the walls, but eventually they expire leaving a drift of fly bodies on the floor. Insect life of any sort is unwelcome in libraries due to our valuable and highly edible collections. Not to mention the general “ick” factor. So my colleague Peg has undertaken to set up a Maginot (or maybe that should be “Maggot”) Line of flystrips around the doors leading to the outside of the archive in hopes of keeping the little buggers out. SFX: Sound of the sweeping broom. Peg whistling cheerily. SFX: Sharp twack as broom strikes wall. Back to sweeping and happy whistling. I didn’t hear the tiny Aiieeeeee! sound the fly made as it perished, but I like to think I did. Wish you were artist, but lack something important like talent? Have no fear. Click on Mr. Picassohead and soon you too will be dragging and dropping just like the master–if the master had been born in the computer age. Check out my portrait right ‘chere.